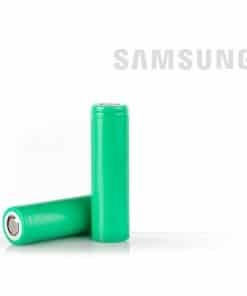 This battery has the same specifications as the Samsung 25R. VAPO RM2.5 batteries include positive and negative indication to avoid confusion and have battery safety information on the side so you can always use your batteries safely! The VAPO RM series are designed for Regulated Mods and the 2.5 correlates to the capacity, this battery is 2500mah – a medium capacity battery. For a high capacity, see our VAPO RM 3.0. These batteries are rated at 20A so are not suitable for use in mechanical mods – we recommend the VTC4 for mechanical mods (mods that do not allow the user to adjust the watts). Only ever use in conjunction with identical, similarly aged, VAPO RM2.5 batteries. For use in regulated mods only. Battery safety is important. Please read up on our battery safety guides.